Product #15822 | SKU BA1711050 | 0.0 (no ratings yet) Thanks for your rating! 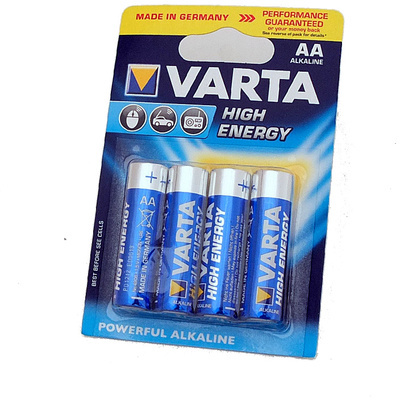 Power any device that accepts AA cells with this 4-pack of standard, all-purpose High-Energy 1.5V AA LR6 Alkaline Batteries from Varta . These German-made cells are non-rechargeable and feature an output of 1.5V. Additionally, they offer up to 80% more power in digital cameras than Varta Simply Alkaline batteries. The "Single Press Out" type packaging enables easy opening, allowing you to extract one at a time and providing storage for unused cells.